We chat to Andrew Smith (CTO at Nucleus) about technology, biggest changes in the last 5 years, what he couldn't do without and his wishes for solving problems with new technology. Andrew was one of the founders of Nucleus Financial, an advisor built wrap platform that supports financial advisors to help their customers, by giving them access to their investments in one secure online platform. Andrew has worked in technology and finance for over 25 years although even before his work life began, Andrew and Nucleus CEO, David Ferguson, used to code computer games together at the age of 10. Andrew’s role as CTO at Nucleus is to manage the product, the technology that underpins the product, and respond to changes in technology that affect Nucleus’s offering. 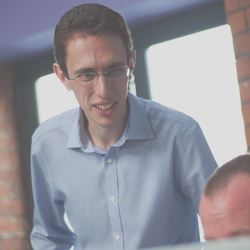 We asked Andrew four questions about the impact of technology developments in his role at Nucleus. Right now is the most exciting time I’ve experienced in technology. In the early and mid-internet years there were many ideas, but the technology wasn’t sophisticated enough to make them work. That has changed, so the most amazing thing is that now things work. Not only that, they are available and accessible to everyone, from 4 to 104. "Now is the time to dream the dreams of what technology can do... and then go and make it happen." I undertook a Masters in 2002 in Artificial Intelligence and Machine Learning, but at the time AI wasn’t anywhere near where it is now. Now you can actually see it working in everyday life; from what amazon recommends to me when I shop online to what I see in my facebook feed. The other change is that people now understand what I do. I used to talk about working in either finance or IT and people didn’t really understand what I was taking about – since “fintech” has entered the common language people finally seem to get it! Everything! Technology can provide a solution to almost anything, from driverless cars to banking on your phone. One of the big things it does is collapsing the supply chain, so that people who traditionally didn’t have access to certain information or services, particularly in finance, can now access those services. By granting access to the masses, rather than limiting it to the privileged few, it gives ordinary people rights. In my view, Blockchain is the single most interesting piece of technology in this area. Blockchain gives people that traditionally may not have access to financial products and services a digital identity for financial transactions, which empowers people. For example, the micro-finance initiatives of over 200 million people in India. In our own small way, we’re helping give access to financial planning through Nucleus, by transforming traditional LifeCo operating models, using technology to reduce costs and complexity, and increase transparency and accessibility. The one thing technology still can’t do is force people to make a decision – which obviously is a good thing. It’s got to be the iphone – the iOS ecosystem, the apps and languages available, I use it everyday, all the time! I should also mention the agile approach to development, whilst not a technology as such, it does permeate across our whole business operation. Even our legal and HR teams use a Kanban board to manage projects in an agile way. We’ll be catching up with Andrew at our event later in the year where we’ll bring together leaders in technology and marketing from some of the most well-known names in retail and finance to share ideas and experience.